Sam Matson tells us about all the different elements of sailing: the physical strain, the psychological tests, and developing business partners. Throughout university I trained and raced part-time with the British Keelboat Academy and Artemis Offshore Academy (AOA), specialising in offshore racing campaigns and in particular 2-handed and solo sailing, in preparation for a full time racing career in the French Figaro II circuit immediately after graduating in 2013. 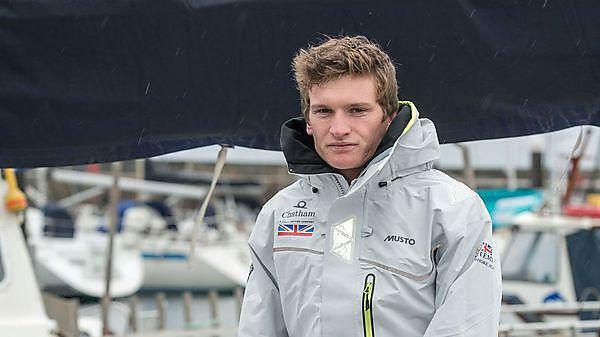 I began training full time in 2013 and moved to France with AOA for the 2014 season, finishing my first La Solitaire du Figaro (the unofficial world championships of solo sailing) as 2nd rookie, top British sailor and 15th overall. With continued support from AOA, I set myself a new target for 2015: to better my previous season’s results and develop a new title partner to join my campaign. By early 2015 I signed a title deal with local shoe manufacturer ‘Chatham’ and finished La Solitaire in 13th overall, ending the French championships in 12th position. With plans to develop the campaign over the next few years in to a Vendee Globe project, the search for new partnerships is an ever continuing aspect to my career. I could probably list over 100 moments where for either physical or psychological reasons, some areas of the racing have been incredibly difficult. However, trying to develop new partners for the project is certainly difficult and, until recently, it was an area in which I felt I had extremely limited knowledge. It is an area of sport often forgotten about, but definitely a critical part of being a professional athlete. My sailing has taken me to some incredible places, and allowed me to see some spectacular things whilst at sea, but there is always something very special about crossing a finish line. In the first leg of my first La Solitaire du Figaro, I had the honour of crossing the line as top rookie and top British sailor in the first UK stopover venue for 10 years, which happened to be Plymouth! Support from family, friends, media, and local community was incredible as I was welcomed into a crowded dock of cheering and TV cameras. A professional sailing career is something I have dreamt of since I began competitively sailing at the age of 8, always with the lifetime ambition of competing in the Vendee Globe. The French Figaro circuit is seen as the training and race boat for current and aspiring vendee globe competitors. I have no regrets; I just hope that I can develop the campaign into something big enough to complete my ambition. Persistence and patience is key. There are plenty of opportunities and ways of getting into professional sailing, depending on the discipline you want to specialise in, but it is not something that happens over night! My degree provided an incredible overview of many aspects associated with professional sailing: from navigation, meteorology, to areas of business which have certainly helped me so far. Not only that, but the opportunity to write a thesis on a subject of my choice allowed me to focus on sleep deprivation and its effects on solo sailing, providing me with knowledge and practices that I use during every race to ensure maximum psychological performance.